We’ve been getting insurance quotes for the whole Pacific passage vibe and those pesky insurance companies are fairly uniform in insisting on there being 3 experienced sailors on board for each crossing. Three. There’s very little way around it other than that I have to become “experienced” by the time we leave (whatever that means). It quickly became clear to us that we’d have to do some serious sailing in our Cape waters, so Stoffel and I planned our first overnight trip to Langebaan. Our mateys Nix and A are joining us for the first part of our voyage: from Mexico to Galapagos (they’ll probably hop on board in Acapulco). They are also doing a pretty awesome (albeit shorter) adventure from October this year. They’ve chartered a smallbutcomfy boat in Florida and they plan to sail to the Bahamas, down to Cuba (which they’ll circle), over to Mexico (east coast) and down central America to Belize. Where they’ll leave the boat and head across the strip to join us on the west coast. * They’re leaving CT in just over a week and (unsurprisingly) have masses of Stuff To Get Done, so we co-ordinated our outing to Langebaan on a weekend that suited them. Langebaan is a lagoon up the west coast. It takes about 1 ½ hours to drive up there, but (as we discovered) it takes a darn side longer to sail to Langebaan. Rick (the munificent father-in-law) owns a 36ft racing boat that he has offered to us as a practice boat: Bally Hoo Too. Back to Friday afternoon and the Great Expedition. The wind was pumping hard as we set out from the harbour. Nix and I later admitted that we both had second thoughts as we watched the famous Cape doctor south easterly shunt clouds over the saddle between Table Mountain and Devils Peak. It was blowing about 30-35 knots. Bally Hoo is a racer: none of the comforting stability of the Laura Takalani and she is designed to cut through the water f-a-s-t. Which means she lists from side to side in the wind. 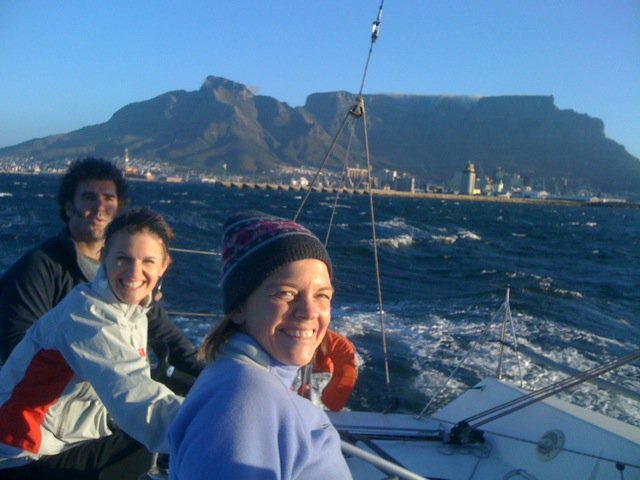 Luckily, even though the wind was wild, the sea was rather flat and we thrust out of Table Bay at a seriously impressive pace. As the sun set, we toasted each other with the first beer of the evening. We had visions of mooring in Langebaan by 2am. Latest. Awesome. Sadly, the wind did not continue to howl. In fact, it dropped off rather impressively after about 3 hours and after sailing in the light conditions for a further 5 hours we eventually resolved to switch on the engine. From the time of casting off to tying up, we took 13 hours to get to Langebaan. When there, we slept for a few hours, ate delicious breakfast on the boat, swam in the sea, sipped a bloody mary and headed back to Cape Town at about lunch time on the Saturday and returned to Bally Hoo Too’s berth at Royal Cape at 1am that morning (we just switched on the engine sooner: the wind was largely not very co-operative). But: Hurrah!!! It was bloody fantastic. I loved it! Stof was a brilliant skip! Team S&S and Team N&A worked well together and apart! Nobody got seasick! It was beautiful and magical. On both evenings the phosphorescence glowed and sparkled around our Bally hull. Dolphins would come shooting like luminous torpedoes towards the boat and stayed for a jaunt at the bow. At one stage when Nix and I were on watch together, we had to wake Skipper Stof because a whale felt like it was breathing a little too closely. I am somewhat relieved to have survived my first (two) nights at sea. And even more relieved to have loved it. * Nix&A’s blog is here. You can read about their take on the Langebaan trip here (and see more photos… while we sailed to Langebaan PRIOR to the camera being lost, we just forgot it in the car. Woops. ).